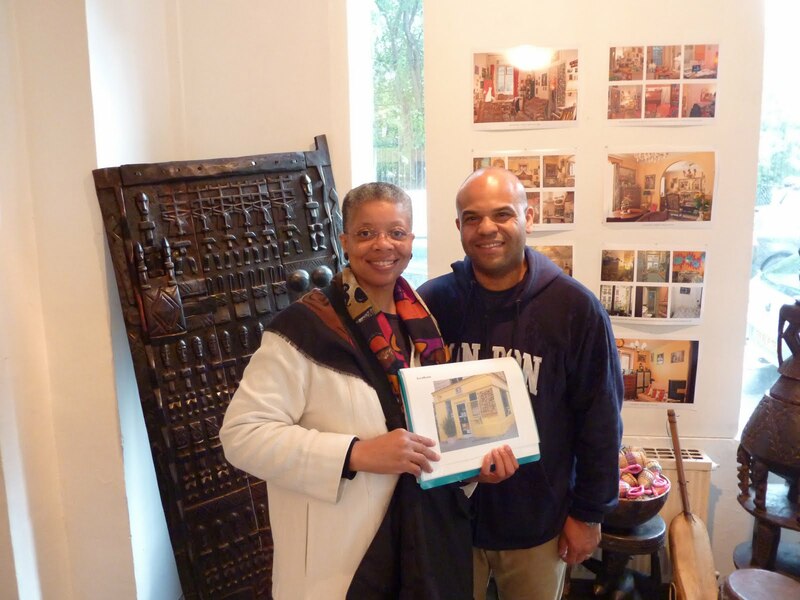 We learned about the Entrée to Black Paris tour from the US Embassy. Monique came highly recommended and accommodated us with a well-tailored tour for our group. Our group included 12 5th graders and 7 adult chaperones from a charter school in Bedford Stuyvesant, Brooklyn. 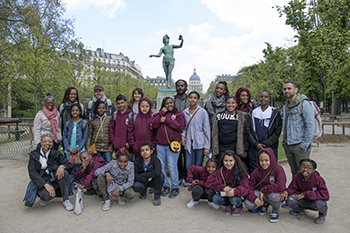 We wanted the tour to be relevant to things our scholars have studied, including the experiences of Black Americans in Paris and other institutions that impact Black people around the globe. 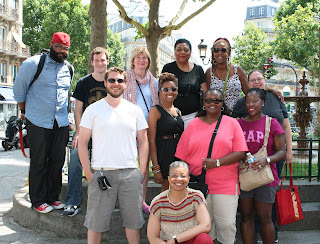 The tour met our expectations and we all learned a great deal about France’s role in the slave trade, famous Black American artists and writers who lived in Paris and several Black political leaders in Paris and their impact on government. It definitely broadened all of our knowledge about the city and there were relevant connections made to our own lives in New York City. Students and chaperones alike enjoyed the tour. The location was also stunning. The Jardin du Luxembourg is such a beautiful and peaceful place. It was a great way to begin our week in Paris. I would highly recommend ETBP tours and thoroughly appreciated the time we spent with Monique. The tour made me love Paris even more and feel tremendous pride that we were able to bring the city to life for our scholars in this way. I found Monique's tour to be the missing link to my Paris experience. 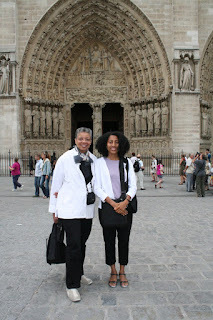 I visited Paris as part of a low-residency MFA program offered by Spalding University. I heard about Monique through a friend who had contracted her for a program she worked for while in Paris. Neither I nor my classmates were disappointed in her tour. In fact, we were more disappointed that the school had not arranged this tour and I told my school this as well. As a class, we were instructed to read the non-fiction book Americans in Paris. Well, what we discovered during our Entrée to Black Paris tour was that much of what was discussed in the book failed to represent the full political and art life of Paris because it neglected the African experience. Many of my classmates who are not of African descent noted that what they enjoyed most about Monique's presentation was her ability to connect the past with the present and to our experience as Americans. She made the necessary connections to make the tour relevant, interesting and a great learning experience. 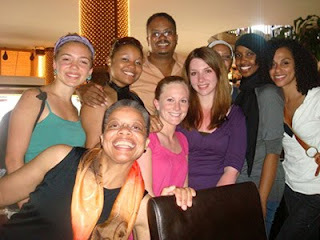 My classmates could not thank me enough for coordinating the tour and I cannot thank Monique enough for elevating my experience and knowledge of my African past and present for myself, my guests, and my classmates. The buildings and streets of Paris tell a deep and rich history of the African-American experience, a history that Monique Wells and Tom Reeves of Entrée to Black Paris helped me to discover. Their meticulous tour planning enabled me, as a first-time visitor, to travel with ease throughout Paris, learning of African-American history in a context and setting far beyond the U.S. border. The ease with which Entrée to Black Paris enabled me to travel throughout Paris and to other areas of France allowed me to focus on my primary purpose for visiting the City—delving into the African-American experience in the City. As Monique revealed in her tour, this experience is wide and deep, with building after building in Paris testifying to the black presence in Paris. There stands, for instance, the Casino de Paris where Josephine Baker performed. Then, among the never-ending array of Paris cafes sits the famous Café de Flore where, in one of its upper rooms, James Baldwin wrote Go Tell It on the Mountain . . . This legacy, this historical fact of the black presence in Paris is not merely a matter of history. African Americans are still living and working in Paris, as is the case of novelist Jake Lamar. After Entrée to Black Paris set up an interview for me with Lamar, I learned from this Bronx native who has chosen to make his home in Paris that, for him, one main attraction of the City is the love Paris shows the literary artist, regardless of his or her level of notoriety. This stands in contrast, Lamar says, to the U.S., which tends to give greatest attention to the most acclaimed literary artists. I can't thank you enough for leading the tours of Barbès and the Chateau Rouge market and Black Paris after World War II. I thought I knew a bit about the black Diaspora in Paris and now I know better! You made each street, apartment, and cafe come alive with your insights into the past and present. I hope our paths cross again the next time I'm in Paris and look forward to seeking you out for other tours you might be leading. Again, thanks for making my trip to Paris more than hoped for -- that is hard to do! As James Baldwin writes: "In Paris, I lived in all parts of the city—on the Right Bank and the Left, among the bourgeoisie and among les misérables, and knew all kinds of people, from pimps and prostitutes in Pigalle to Egyptian bankers in Neuilly. This may sound extremely unprincipled or even obscurely immoral: I found it healthy. I love to talk to people, all kinds of people, and almost everyone, as I hope we still know, loves a man who loves to listen." Indeed, Baldwin captures beautifully the hope, dream, and mystique of Paris, as did Entrée to Black Paris' Rendezvous Eighteenth tour, experienced by my students in 2008 during my "Black Paris" study abroad course. Meeting and engaging with the celebrated author himself, Lamar, was both sublime and instructive! A great time had by all! Highly, highly recommended!